Alan Stanford directs Somerset Maugham’s 1920s comedy of marital infidelity and hypocrisy to amusing effect, but in a broad manner. Constance Middleton (Tara Egan Langley) has it all: rich, lovely house, delightful daughter at boarding school. But her friends and relations feel sorry for her. Well, some of them do. Her redoubtable mother Mrs Culver (Belinda Lang) most certainly does not; indeed she has called on her daughter expressly to prevent her spinster daughter Martha (Rachel O’Byrne) informing Constance that her husband John (Simon O’Gorman) is having an affair with Constance’s bubbly and vacuous best friend Marie-Louise (Caoimhe O’Malley). Both of them are surprised when they learn that Constance knew all along, and even more surprised when she manages to convince Marie-Louise’s husband Mortimer (Peter Gaynor) that he is a monstrous cad for suspecting his wife. Little do they realise that Constance has a plan, involving gossip, plausible deniability, and her former beau Bernard (Conor Mullen) just returned from China. Constance takes a job with her entrepreneur friend Barbara (Ruth McGill), and emancipates herself from economic dependence on her husband; much to his fury. Indeed there’s a lot of comic male bluster in this play. The Constant Wife is quite funny, but is played as slapstick. Gaynor has a fantastic stride of determined and manly apology, while Mullen lurks in a doorway looking back and forth at the adulterous couple with the suspicious gaze of a man who’s just been told what’s going on (and leans back hilariously for one parting warning glance), and O’Gorman nearly blows a gasket in remaining dashed polite to a man he wholeheartedly desires to knock down and set to. Given Constance’s Shavian speeches on economics and her mother’s Bracknellisms you wonder if Patrick Mason could elicit subtler laughs and trim the third act repetitions. O’Malley Fassbenders as the callous airhead, and Lang is delightfully withering, but O’Byrne overplays her RP accent somewhat. Eileen Diss’ appropriately airy set design gives us a drawing room flooded with light, and Peter O’Brien pulls out all the stops in designing a whole wardrobe of glorious flapper era outfits for Maugham’s women to model. Programming this as high summer fare, for the second time in a decade, seemed an absurd exemplar of Michael Colgan’s latter sterility as artistic director, and news of his retirement followed soon after. Maugham’s play is good, but can one justify reviving it when the Gate has only produced three Stoppard shows since 1984? Being The Real Thing, and Arcadia twice. We know the Gate needs full houses but couldn’t an exuberant Stoppard like Night and Day, Indian Ink, or Jumpers pack a house too? The Constant Wife is entertaining, but not of Cowardian calibre. It and the Abbey’s ramshackle The Wake have represented a veritable Scylla and Charybdis of commerce over aesthetics and ideology over aesthetics this summer. The Constant Wife continues its run at the Gate Theatre until the 3rd of September. A Month in the Country has had its run in the Gate extended to the 29th of August, so if you’re wondering whether to catch Ethan McSweeney’s production at the last moment here’s a teaser for my review for HeadStuff. Natalya (Aislin McGuckin) dominates the life of an 1850s Russian country house. She is married to the older Arkady (Nick Dunning), who seems oblivious to the platonic love affair she’s conducting with his erstwhile friend Michel (Simon O’Gorman). Natalya herself has a blind spot though, she fails to spot that her teenage ward Vera (Caoimhe O’Malley) has fallen for new tutor Aleksey (Dominic Thorburn). When it’s pointed out to her, and ever-visiting doctor Shpigelsky (Mark O’Regan) approaches her with a proposal of marriage for Vera from the aged Bolshintsov (Pat McGrath), Natalya becomes consumed by jealousy and starts plotting to marry off Vera to leave herself without a romantic rival for the young tutor’s affections. Michel is unable to prevent these machinations, while Arkady’s mother Anna (Barbara Brennan), Herr Schaff (Peter Gaynor), and Lizaveta (Ingrid Craigie) have never stood up to Natalya. Ethan McSweeny directs Brian Friel’s version of Ivan Turgenev’s classic comedy-drama concerning the complicated romantic entanglements on a 19th Century Russian estate in high summer. Natalya (Aislin McGuckin) is married to the much older Arkady (Nick Dunning), a man too distracted with improvements to his estate to notice that his permanent houseguest and best friend Michel (Simon O’Gorman) is plainly in love with Natalya. Other residents of the Arkady house include bombastic German Herr Schaff (Peter Gaynor), long-suffering Lizaveta (Ingrid Craigie), Arkady’s formidable mother Anna (Barbara Brennan), new tutor Aleksey (Dominic Thorburn), and Natalya’s teenage ward Vera (Caoimhe O’Malley). Local doctor Shpigelsky (Mark O’Regan) doesn’t actually live there, but he might as well given that he spends as much time there as the eternally distracted bickering servants Matvey (Dermot Magennis) and Katya (Clare Monnelly). But when Vera falls in love with Aleksey and Natalya becomes madly infatuated with him, and blind to the counsel of Michel, the stage is set for betrayal, heartbreak, and reproach. ADP Briggs has convincingly argued that the parallels in characters and relationships between A Month in the Country and Uncle Vanya are too close to be coincidental; Chekhov as we know him is unthinkable without Turgenev’s exemplar. Certainly a scene of total chaos in the final act as several characters wander into the drawing room to resolve several sub-plots anticipates Chekhov’s fondness for rattling several scenes through one set. Friel’s 1992 version gives the servants Northern Irish leanings against an RP aristocracy, and Bolshintsov (Pat McGrath) is amusingly rendered as a 1950s Irish bachelor farmer. An interesting echo is a devastated Arkady’s lament that he needed a measure of discretion from Natalya and Michel in order to successfully not know what he does know, which seems to speak to Judith’s speech in Aristocrats on how her circumscribed life is possible to endure so long as its limits are not hammered home. Oddly enough there are anticipations of another playwright Friel has translated, Ibsen, in Natalya’s manipulations and impulsive scheming. It’s as if Judge Brack had never cornered Hedda Gabler and she continued to relieve her boredom by insulting people, thwarting romances, and impulsively manipulating people. Aislin McGuckin who had some imperious moments in Heartbreak House at the Abbey last summer rises to the challenge of such a figure, and alternates knowing vocal sultriness, with epic self-pity, blind fury, and vulnerable self-awareness. Natalya’s proto-Chekhovian soliloquies baffled 1850 audiences, but their psychological quality is very modern; although they can seem repetitious, especially if you saw Mark O’Rowe’s lean version of Ibsen in April. O’Gorman’s Michel is a study in defeat, while Dunning’s Arkady comes into his own after the interval as a comic character in his obliviousness who is tragic in that he needs to be oblivious to function. O’Malley slightly overdoes the girlishness of Vera, before maturing under the machinations of Natalya, while O’Regan hoovers up good lines as punning peasant made good Shpigelsky. Gaynor meanwhile lets rip in support. The expected silliness he suppressed in his Hedda Gabler character in April appears here in spades. Francis O’Connor’s clever set and Peter O’Brien elegant costumes are the perfect visual palette for Turgenev’s tale of misplaced affections and quiet acceptances in a production of bittersweet comedy. 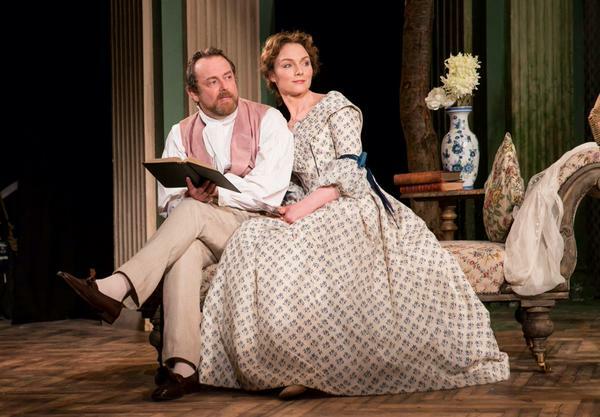 A Month in the Country continues its run at the Gate until August 22nd.